HOLY f***! Today was the big day and it sure as hell didn't let me down. Early start by getting to Kawarau Bridge, the birthplace of bungy jumping. It was just me and an older couple on that run, so setting up went fast. First you sign a s***load of forms and waivers, then you weigh in, so they know what rope to use and so on. After that we jumped in a bus going to the bridge, because you start out in the city and then they take you out to the jump site. For the first jump, I was mostly just eager and ready. I mean leaping of into thin air is a bit scary no matter what, but I still wasn't that terrified, mostly just looking forward to it. So there we were, standing outside, all strapped up in harnesses and a thick cord around our ankles. I was last, and when my turn came you simply "walked the plank" and they did a quick countdown: 3, 2, 1, GO! And you jumped... Hoping the rope was strong enough, that it was properly attatched, that you wouldn't get tangeled up and so on. The jump wasn't that bad, you were just focused on doing the right thing when your turn came up. The seconds that followed, however, were quite a lot worse. When you've let go of your own fate and just see the ground closing in rapidly. At kawarau the jump is only 43 meters all in all though, so it didnt take long until you started slowing down and then bouncing back up again. Eventually they lowered you down into a raft on the river and you walked up to the top on your own. 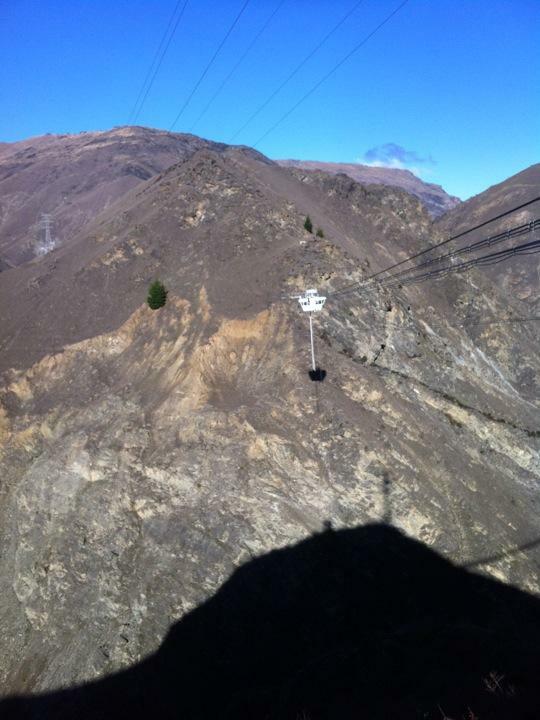 We had like an hour after that to chill around before the bus came and picked us up for the big thrill: Nevis Bungy! Biggest bungy jump in australasia, 134 meters of falling, 8,5 seconds of freefall before the rope is even straight, jumping out from a platform suspended mid-air on a highwire with just a tiny little stream far below you in the canyon. Just to get there you spend like half an hour drivning nasty steep slopes on an almost off-road trail. When you finally, after a long climb with the bus reach the summit and see the platform hanging freakishly high above the ground... That's when you need an extra pair of underwear. Every single person in the bus was already scared s***less, and they hadnt even given us our harnesses yet. However, when I sat down in the special sort of chair that they've got for tying your feet together, that's when I realized what I was actually about to do. Holy s*** was I nervous by then. Especially sittning there when they were fixing up the cords and stuff. When everything was hooked up and you were ready to jump, you knew that everything was as it should be, but if you'd fall before all that, even though you were always attached to something, you weren't sure what was going to happen. Stepping out on the plank and knowing What was about to happen was definately one of the greatest thrills I've ever experienced. You can feel the hand of the jump master holding you firmly back. For a second you start to doubt if this is actually happening, if you really are this dumb or if it's just a dream. Your mind is playing tricks on you with all the adrenalin pumped out, but there's no time to think of that. You just literally f*** everything, pray to krishna, Allah, budda and the flying spaghetti monster that nothing f***s up and fling yourself out. The first feeling is one of relief and joy that you are doing something amazing. The second thing that pops in your head is how f***ing long you're still accelerating and how fast the ground is approaching. This is when the fear really hits you like a cold cod slapped in your face. The most amazing thrill you've ever experienced, when your stomach is still up by the jump platform and your head is rushing downwards. It is really unbeliveable until you try it, can't be understood until you've felt your own sanity leave you. Eventually you start to slow down, but it takes far longer than you thought possible for you to stop and start going back up. When you finally get back topside all you can think about is doing it again! But after that I still had the swing to do, which was a piece of cake after jumping out headfirst. In short: money well spent, awesome s***.